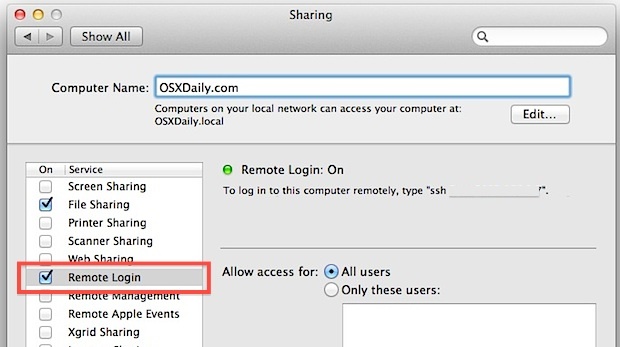 Remote Login is a feature in Mac OS X’s Sharing preferences that allow remote users to connect to a Mac in a secure fashion by using the OpenSSH protocols. Essentially, it starts an SSH server on a Mac, which includes the ability to accept incoming SSH connections, which is the secure replacement for telnet. Additionally, it includes and enables the SFTP server, which is the secure replacement for FTP, and finally it also enables SCP, for secure remote copying. If this sounds complicated or confusing, it’s really not, and we’ll walk through exactly how to quickly enable and set up the SSH server on a Mac so that it can accept inbound secured ssh, sftp, and scp connections. 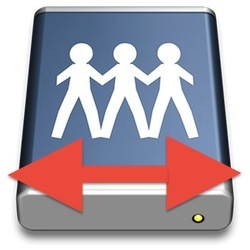 The inclusion of SSH, and thereby SFTP, through Remote Login also explains why Apple ditched the FTP server in Lion onward onward (this remains the same in El Capitan, Yosemite, Mavericks, and Mountain Lion), as they opted for the infinitely more secure and encrypted SSH and SFTP options, and bundled it within Sharing’s “Remote Login” option as part of the entire SSH package. By starting the “Remote Login” service, you enable SSH and SFTP servers in OS X. These instructions are the same for enabling remote login and accompanying SSH servers in OS X El Capitan, Yosemite 10.11, 10.10, OS X Mavericks 10.9, 10.8 Mountain Lion, 10.7 Lion, and 10.6 Snow Leopard. Clicking the checkbox will instantly start the various remote login servers, including sftp and ssh. If you want to limit incoming SSH access to certain users, you can do so in the same preference panel by ticking “Only these users” and then manually adding them by clicking on the + icon. This brings up a list of Users & Groups on the Mac that you can select from. Think of this as an extra security step, although SSH by default is quite secure as is due to the nature of the protocol. Connecting to localhost isn’t too useful though, and this is called Remote Login for a reason, because it allows for secured connections to remote Macs through either the SSH command line interface, SFTP through any modern FTP/SFTP client, or with a direct file transfer by using the scp command from the terminal of other Macs or unix machines. We’ll focus primarily on the SSH and SFTP side of things because that is generally what the most commonly needed. Now that you have SSH up and running, connecting to it remotely is easy. The great thing about this is you can now connect to the Mac from virtually any other operating system, all you need is an SSH client. SSH clients are bundled with Mac OS X and Linux so there are no downloads necessary there, you can just open the Terminal and use the ‘ssh’ commands, but iOS users can use Prompt and Windows users can get PuTTY (its free). You’ll now be logged into the Mac through SSH, this can be done remotely or over a local network, and all traffic to and from the machines is securely encrypted. If you want to use SCP instead, the procedure is the same except you use ‘scp’ as the commands instead. A few things to remember here: your local IP address (on a LAN) is different than your external IP address (to the outside world). The easiest way to get a machines external IP is by going to a site like ‘whatismyip.org’ but keep in mind that if the Mac is behind a router with a firewall, you would have to open the ports on the router to be able to access it. That process is different depending on the router and firewall in use, so it wouldn’t make much sense to cover it here. Finally, breaking away from Mac OS X and going to the mobile world with iOS, you can actually SSH into iPhones and iPads too by setting up servers on iOS devices too, but it’s a bit more complicated and requires a jailbreak to be able to enable the servers and gain access to the iOS command line. I have this enabled at home so I can tunnel my traffic through it from public wifi spots, works like a charm. Test it, check IP, done! where can we find the password for ssh remote login?